Late Breaking Abstracts are now being accepted for the 2019 Annual Meeting. Submit your abstract today and have a chance to present your new research at the SSR Annual Meeting in July. The deadline for submission is April 15, 2019. Submissions should adhere to the guidelines listed below. Late breaking abstract submissions will only be considered for poster presentation. 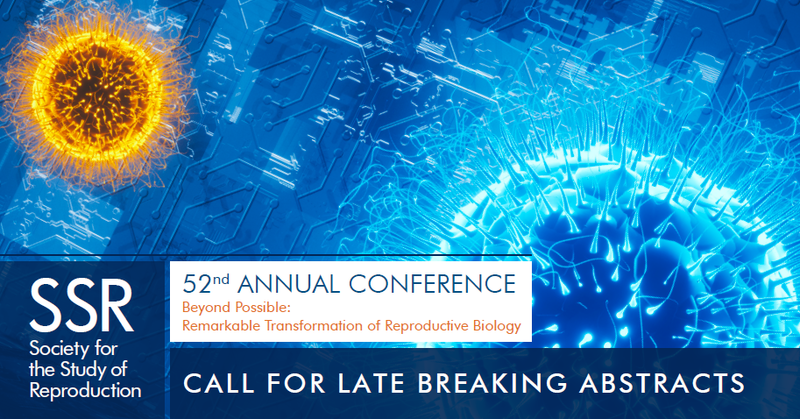 Submit your late breaking abstract HERE. The SSR Program Committee welcomes abstracts reporting new basic, clinical, and/or translational research findings in the field of reproduction. You do not need to be a member of SSR to submit an abstract. There are no restrictions on species involved. Please adhere to all rules for the submission and format of abstracts. Failure to comply may be cause for rejection. All authors of each abstract will receive an automated e-mail confirmation containing a submission ID number. You must indicate whether or not you would be willing, if selected, to give an Oral Presentation or Flash Talk. Choosing an oral presentation or flash talk does NOT ensure you will be selected for an oral or flash talk. Organizers of the Symposia and invited reviewers will review all submitted abstracts. Abstracts that fit the topic of a Symposium will be selected for an oral presentation. Posters: All posters will be presented at their scheduled times during morning poster sessions. The past two meetings encouraged poster presenters to provide an audio description of their posters that attendees accessed by scanning a QR code on the poster. This year, the Program Committee will allow QRs, if presenters wish to do so, and poster presenters may use a QR code for any supplemental information, including audio description, multimedia files, statistical data, jpeg of the poster, etc. This supplemental data is for attendees only and will not affect awards evaluation (e.g., poster presenters who are finalists in the Trainee Research Competition). Poster Flash Talks: Poster Flash Talks will highlight the poster and be limited to two slides (no animations), one of which lists the title, authors, affiliations, and abstract number, and two minutes in length. Education and Research Resources Posters: The SSR Program Committee encourages presentations on teaching methodologies, databases, and resources of interest to the reproductive biology community. These abstracts will be considered for poster presentation only. Submissions in this topic area will not count against the abstract limit for research presentations (i.e., you may present [be the first author of] both a research and an education and research resources abstract). Please contact the SSR Business Office if you have questions. The submission deadline is 11:59 PM (EST) on February 15, 2019. Please see the Submission Procedures below for specific instructions. You will be able to save your submission-in-progress in the system; however, the submission must be completed and uploaded by the submission deadline. All authors will be notified by e-mail of the SSR Program Committee's decision regarding acceptance of the abstract approximately 6–7 weeks after the abstract submission deadline. For information about visas and/or formal letters of invitation, please go to this page. The SSR no longer publishes abstracts in a special issue of its journal, Biology of Reproduction. The abstracts will be available electronically to Annual Meeting participants on the SSR web site and other formats. 3. Authorship: An individual may be first or presenting author on no more than two abstracts. An individual may be selected to present only one abstract as an oral talk at the meeting, and abstracts not selected for oral presentation will be expected to be presented by the submitting author as a poster. However, an author's name may appear on multiple abstracts. All authors will be notified when the abstract is submitted. Please remember to contact co-authors prior to submission. The SSR Business Office will check first authors prior to review and will contact you if you are listed as first author on more than two abstracts; you will be asked to either confer with your co-authors and change the first author of one of the abstracts (requiring the new first author to confirm expected attendance at the Annual Meeting) or you will be asked to withdraw one of the abstracts. The Program Committee will not make this choice for you. 4. Presentation: The first author must present the abstract. Any exception must be approved by the Chairs of the Program Committee more than one week prior to the start of the meeting. Only a co-author of the abstract will be considered an acceptable replacement and that co-author should not be giving another presentation at this meeting. Each co-author must agree in principle with the information and conclusions contained within the abstract. 5. Meeting Attendance: Submission of an abstract constitutes an agreement that the presenting author will attend the meeting to present the abstract if the abstract is accepted. The presenting author must register for the Annual Meeting before the registration deadline. If the presenting author has not registered by this deadline and is chosen for an Oral Talk or for a Poster Flash Talk presentation, the meeting staff will attempt to contact the author. If the presenting author does not respond in a timely manner, another abstract will be chosen for oral presentation or poster talk. 6. Certification: The presenting author must certify that the conditions for submission have been satisfied and that all animal and human welfare and ethical considerations have been met. Abstracts that violate these ethics will be rejected. Please view the sample abstracts document for layout and formatting examples. Financial support may be listed at the end of the abstract. Do not use headers (e.g., objectives, methods) in your abstract. Do not put in any paragraph breaks. Do not use phrases such as "will be discussed" or "will be presented." Avoid abbreviations and acronyms, and do not cite references. Do not include tables, figures, or references. Abstracts may not contain any type of advertising or logo, including trademark and copyright symbols. Nomenclature: The SSR requires use of approved gene and protein nomenclature. Please refer to the Nomenclature Guidelines and Requirements for the Society's journal, Biology of Reproduction, for specific instructions for gene/protein names/symbols and correct formatting. 8. Format: You will have to enter your Title twice in the submission site. The Presentation Title will be for the abstract submission site and the Display Title will be used for the Program Book. The Presentation and Display titles may not exceed 150 characters. Presentation Title: Type the title in lower case with initial letters capitalized (title case), using italics as necessary. Please use appropriate ending punctuation (period/full stop or question mark). Spell out Greek characters as they will not be retained. Do not use any formating for genetic or scientific nomenclature such as superscripts, subscripts, and italics, they may not translate. Display Title: Type the title using and Greek characters and text formatting for genetic or scientific nomenclature such as superscripts, subscripts, and italics. (e.g., <i>Ldhc</i> gene; 10<sup>7</sup>; PGF<sub> 2alpha</sub>). Please use tags as follows: You will also have the option to use the tabs in the Display Title text box to format your text. 9. The Abstract—excluding title, authors, and affiliations—may not exceed 300 words. You can type your abstract in the display box provided in the abstract site. 10. Competitions: Individuals wishing to be considered for SSR Trainee Merit Awards (SSR Trainee Research Awards, USDA–NIFA–AFRI Merit Awards and Lalor Foundation Merit Awards) must indicate their eligibility at the time the abstract is submitted, be fully qualified to compete for each award indicated, and, as presenting author, have played a major role in the design and implementation of the experiments, analysis of the data, interpretation of the results, and writing of the abstract. The Awards Committee will select finalists on the basis of an evaluation of the meeting abstracts submitted for competition. Please read the Travel Grants and Fellowships and Trainee Merit Awards pages for further details. NOTE: Abstracts selected for the SSR Trainee Research Award Oral Competition will not be eligible for presentation in a Symposium. Finalists in the Poster Competition may be selected for a Poster Flash Talk but must present for the competition and Awards Committee Review in one of the regular poster sessions. 11. Withdrawal: If an abstract must be withdrawn, written notice of withdrawal—signed by the presenting author—must be submitted (by fax, e-mail, or regular mail) to the SSR Business Office. This notice must state the reason(s) for withdrawal of the abstract and attest that all authors agree that the abstract must be withdrawn. All authors will receive a written confirmation of the withdrawal by e-mail. 12. Disclosure of Affiliations: Each author must disclose any financial, personal, or professional relationships with other people or organizations that could reasonably be perceived as conflicts of interest or as potentially influencing or biasing their work. Author(s) disclosure(s) must appear on the oral abstract presentation slides or poster presentation board.